AIM #3 is a premium quality, single component waterproofing coating that is especially designed to waterproof building foundations. It is resistant to sulfates, soil contaminants, bacteria, and other environmental conditions. AIM #3 is designed for permanent flexibility and toughness, to bridge and move with hairline cracks, and to resist impingement attack. Provides vapor barrier waterproofing for floors and walls in freezers, walk-in coolers and blast refrigerators. Impermeability to gas diffusion seals, floors and walls against radon and obnoxious effluvia. Protects the walls and doors of malting facilities and mushroom houses from steam infiltration. Seals the walls, floors and insulation of wood drying kilns, resists tannins, etc. Can be used over below pavers, concrete, fiberglass composites, insulation, most metals, mineral composites, wood, wood composites, rubber/plastic composites, and other surfaces. 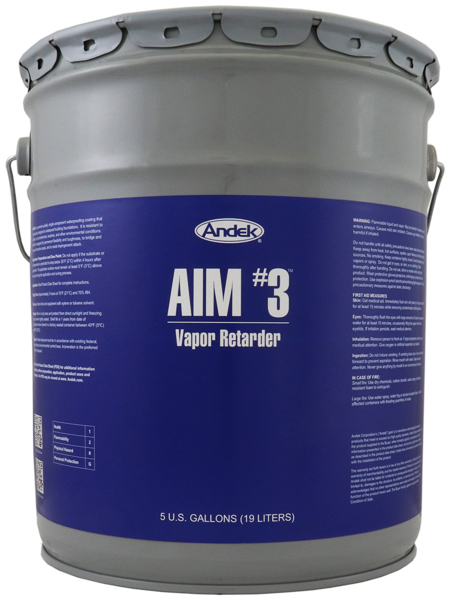 If airless spray application is desired, a custom blended AIM #3 version is available to be used with the following equipment: ratio 30:1 or 40:1 with a ½” or ¾” hose and a #35 or larger tip. A shorter hose will increase output at the tip. Apply AIM #3 in a smooth, even fashion to achieve a uniform coating thickness in either 1 or 2 coats. Store in a dry area and protect from direct sunlight and freezing. Keep container tightly sealed. Shelf life is 1 years from date of manufacture when stored in a factory sealed container between 40ºF (5ºC) and 90ºF (32ºC).